A young D. James Kennedy arrived at Coral Ridge Presbyterian Church in Ft. Lauderdale, Florida, in 1959, and after just three years brought change to the congregation of 45: attendance declined to 17! It was then that a pastor friend, Kennedy Smartt, invited Kennedy to assist him in–of all things–a series of evangelistic services in Scottdale, Georgia. “I who had decimated one church was being asked to ship my technique across state lines. Have plague will travel!” quipped Kennedy. During those 10 days of meetings, Kennedy watched Smartt—future president of the Presbyterian Church in America—engage people spiritually. By the end of the meetings, 54 people made professions of faith in Christ. Kennedy returned to Fort Lauderdale with the seeds that built a thriving church. Coral Ridge began to grow, and after 12-years church membership increased to 2,000. More broadly, Kennedy made witness-training the bedrock of his ministry, and launched what the evangelistic program called Evangelism Explosion. By 1996 Evangelism Explosion was planted in all nations of the world. Materials have been translated into more than 70 different languages and clinics have been held in many nations. Kennedy, who died in 2007, became one of the best known Christian ministers in the world by way of his television, radio, and the Internet broadcasts. A televangelist of a different stripe, Kennedy’s formal—almost arrogant to some–Presbyterian bearing, preaching in robes and traditional language, set him apart from the histrionics of some of the TV preachers and from the informality of a new generation of talkers. Kennedy served for 47 years as Senior Minister of Coral Ridge Presbyterian Church. A modest mission church when Kennedy arrived in 1959, the rocketing growth of the church made it, for 15 years, the fastest growing Presbyterian church in America. Decision magazine named the church one of the “Five Great Churches of North America.” In 2005, Dr. Kennedy was inducted into the National Religious Broadcasters Hall of Fame. Well regarded for his evangelism program and his television preaching, Kennedy was drawn like others of his generation to divert time and resources to political and cultural renewal. He did this through personal involvement, but through the development of the Center for Christian Statesmanship in Washington, D.C., and the Center for Reclaiming America. Both efforts were shuttered as his health declined and preceded Kennedy in death. 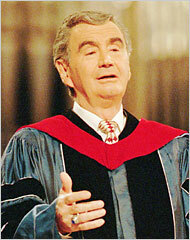 Kennedy was not able to resume his preaching after December 2006 heart attack and died in September 2007. In addition to the church and Evangelism Explosion, Kennedy leaves two educational legacies: Westminster Academy, a Pre-K to 12th grade private school in Ft. Lauderdale, and Knox Theological Seminary, a reformed seminary begun in 1989 to prepare and equip Christians for ministry. It is likely that EE was his unique and most significant accomplishment and his enduring legacy from a life lived large. For this had great influence on the church’s evangelistic priorities, while his other ventures produced, to be charitable, mixed results. 50 leaders of the evangelical generation: #7 James Dobson. The Voice. 50 Leaders of the Evangelical Generation: #39 Andy Miller. Happy Salvationist.